As a Christian woman, many colorful nuances make up the portrait of who you are, be it an aunt, a wife, a sister, a mom, or a friend. Pulled in many different directions, sometimes you feel depleted. With Inkspirations The Art of Grace, you can renew your heart and soul by spending quiet, creative time with yourself and with God. Artist Erin Leigh's free-flowing whimsical imagery is paired with powerful scripture, especially for women, to help you rise above life's challenges and celebrate its joys. From having patience in God's timing ("Blessed is she who believed that the Lord would fulfill His promises to her." --Luke 1:45), to maintaining faith in dark times ("God is within her; she will not fall." --Psalm 46:5) to loving yourself ("Marvelous are your works; and that my soul knows very well." --Psalm 139:14), to doing the right thing ("Do justly, Love mercy, Walk humbly." --Micah 6:8). With perforated pages for easy tearing, and a special lay-flat binding, Inkspirations The Art of Grace provides a perfect canvas to help Christian women make everyday a masterpiece. Have you ever surprised yourself by creating something really great? A delicious meal, a homemade gift, a memorable party . . . anything. That sense of overwhelming satisfaction and joy is no mistake. It's a part of us. We were made to create. And as we use the creative gifts that God has given us, that part of us comes alive. God's Word to us begins and ends with creation. In the beginning God created. And then He created some more. Until, finally, He created His masterpiece in His image. God used His creativity to breathe life into our world. He turned utter darkness into light and dirt into life. He created something from nothing. And He invites us to join Him in doing the same. We may not be separating darkness from light or creating a new species, but by planting the seed of creativity in our souls, God invites us to join Him. My hope for you as you color these pages is that God's Words will come alive in your life as you pray and reflect on them. That they would not simply be words and doodles on a page, but that God would use them to speak His truth and His love into your life. As you fill these pages with beautiful colors, I hope that you feel inspired and renewed—that you reconnect with your artistic gifts or discover talents you didn't know you had, and that you find a restorative way to relax, reflect, and rekindle your creative spirit. I am blessed to work as a first-grade teacher. On the first day of school every year, I tell my nervous and eager students the most important rule: It's always okay to mess up. Without permission to make mistakes, many of my students are paralyzed with fear. But once they know they don't have to be perfect, they have the freedom to try. Sometimes we adults feel like first-graders on the first day of school. We walk into new situations wondering, Can I do this? Am I smart enough? Am I good enough? I am so thankful to God that the answer is a resounding 'No.' Every. Single. Time. Nope. I can't do this on my own. I need you, Lord. Nope, I'm not smart enough. I need you, Lord. Nope, I'm not good enough. I need you, Lord. God's love for us doesn't depend on us being good enough or smart enough. It doesn't depend on following rules. It doesn't even depend on how much we love Him. His love for us depends on Him alone and what He has already done on the cross for us. It is already finished. There is nothing I can do or say to make God love me more or any less. And there is nothing I can do to earn my way to Him. Grace is an unmerited favor. An unmerited gift. God's grace means knowing that I will mess up every single day, because I am human; that I can't do this life on my own, and that I need Him every minute of every day. God's grace allows me permission to stop striving and doing and trying so hard. It allows me to rest and be exactly who God created me to be, because He has already done the hard work. I don't have to—in fact, I can't—earn His love. Experiencing life (and creating anything new) is about the process, not the product. It's about what God is doing every day and how we can draw closer to Him. My hope is that the art and devotions in this book offer you a way to draw closer to God and to reflect upon His grace while discovering the many colorful blessings in your own life. ©2017 HCI Books. All rights reserved. 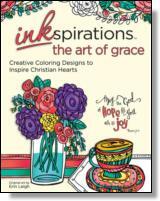 Reprinted from Inkspirations The Art of Grace: Creative Coloring Designs to Inspire Christian Hearts. No part of this publication may be reproduced, stored in a retrieval system or transmitted in any form or by any means, without the written permission of the publisher. Publisher: Health Communications, Inc., 3201 SW 15th Street, Deerfield Beach, FL 33442. Erin Leigh is a Christian, a mom, a teacher, and a well-known illustrator with a thriving Etsy shop. In addition to her freelance art, she illustrated a coloring book for MOBS, a nationwide group of Christian moms. Visit artbyerinleigh.com to see her work.